Saint Basil the Great was born about the end of the year 329 in Caesarea of Cappadocia, to a family renowned for their learning and holiness. His parents' names were Basil and Emily. His mother Emily (commemorated July 19) and his grandmother Macrina (Jan. 14) are Saints of the Church, together with all his brothers and sisters: Macrina, his elder sister (July 19), Gregory of Nyssa (Jan. to), Peter of Sebastia (Jan. 9), and Naucratius. Basil studied in Constantnople under the sophist Libanius, then in Athens, where also he formed a friendship with the young Gregory, a fellow Cappadocian, later called "the Theologian." Through the good influence of his sister Macrina (see July 19), he chose to embrace the ascetical life, abandoning his worldly career. He visited the monks in Egypt, in Palestine, in Syria, and in Mesopotamia, and upon returning to Caesarea, he departed to a hermitage on the Iris River in Pontus, not far from Annesi, where his mother and his sister Macrina were already treading the path of the ascetical life; here he also wrote his ascetical homilies. About the year 370, when the bishop of his country reposed, he was elected to succeed to his throne and was entrusted with the Church of Christ, which he tended for eight years, living in voluntary poverty and strict asceticism, having no other care than to defend holy Orthodoxy as a worthy successor of the Apostles. The Emperor Valens, and Modestus, the Eparch of the East, who were of one mind with the Arians, tried with threats of exile and of torments to bend the Saint to their own confession, because he was the bastion of Orthodoxy in all Cappadocia, and preserved it from heresy when Arianism was at its strongest. But he set all their malice at nought, and in his willingness to give himself up to every suffering for the sake of the Faith, showed himself to be a martyr by volition. Modestus, amazed at Basil's fearlessness in his presence, said that no one had ever so spoken to him. "Perhaps," answered the Saint, "you have never met a bishop before." The Emperor Valens himself was almost won over by Basil's dignity and wisdom. When Valens' son fell gravely sick, he asked Saint Basil to pray for him. 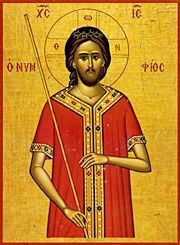 The Saint promised that his son would be restated if Valens agreed to have him baptized by the Orthodox; Valens agreed, Basil prayed, and the son was restored. But afterwards the Emperor had him baptized by Arians, and the child died soon after. Later, Valens, persuaded by his counsellors, decided to send the Saint into exile because he would not accept the Arians into communion; but his pen broke when he was signing the edict of banishment. He tried a second time and a third, but the same thing happened, so that the Emperor was filled with dread, and tore up the document, and Basil was not banished. The truly great Basil, spent with extreme ascetical practices and continual labours, at the helm of the church, departed to the Lord on the 1st of January, in 379. at the age of forty-nine. His writings are replete with wisdom and erudition, and rich are these gifts he set forth the doctrines concerning the mysteries both of the creation (see his Hexaemeron) and of the Holy Trinity (see On the Holy Spirit). Because of the majesty and keenness of his eloquence, he is honoured as "the revealer of heavenly things" and "the Great." Saint Basil is also celebrated on January 30th with Saint Gregory the Theologian and Saint John Chrysostom. Your voice resounded throughout the world that received your word by which, in godly manner, you taught dogma, clarified the nature of beings, and set in order the character of people. Venerable father, Royal Priesthood, intercede to Christ God to grant us great mercy. For the Church art thou in truth a firm foundation, granting an inviolate lordship unto all mortal men and sealing it with what thou hast taught, O righteous Basil, revealer of heavenly things. Source: Greek Orthodox Archdiocese of America, http://www.goarch.org/chapel/saints/364.